Oregano (also called wild marjoram) is a well-known culinary herb which is best known for its use in pizza, spaghetti and a number of Italian dishes incorporating tomato bases. 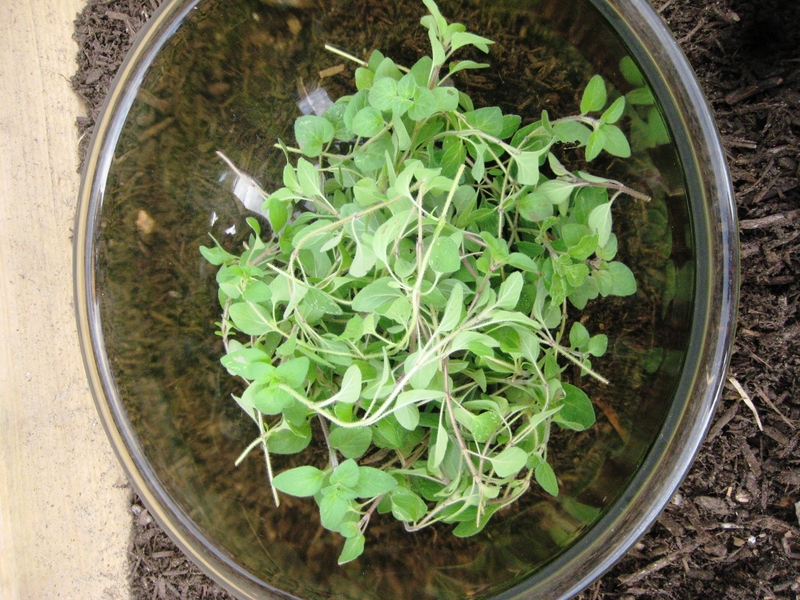 Oregano, like basil and sage, is a member of the mint family and is a perennial in our area. I planted two varieties: Greek and Mexican. 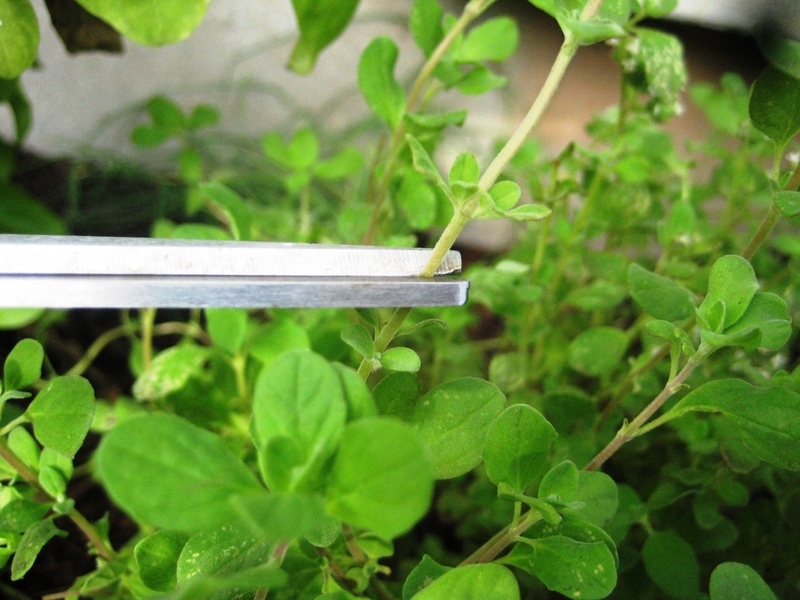 Oregano’s cousin, Marjoram (or Sweet Oregano as it is sometimes called), is also a perennial that is hardy in our area. Marjoram is the main ingredient in store-bought Italian seasoning and in Herbes de Provence and has a characteristically delicate, sweet flavor that is at its best when added late to a dish so that the flavor isn’t lost. Both oregano and marjoram dry exceptionally well, with their flavors intensifying instead of dissipating like herbs such as basil. Personally, the woody and floral perfume of freshly dried marjoram is heavenly and its flavor on chicken is truly wonderful. It goes well with lavender. While I use the Greek oregano for Italian cuisine, I think the Mexican oregano truly shines when combined with spicy tomato dishes because of its bold, peppery flavor, so I generously add it in along with crushed red pepper to just about any Mexican recipe. It pairs nicely with cumin and cilantro. Both types are fairly drought resistant and had no problem surviving the record Texas summer we had here in Austin this year. With watering every five days or so, the two types of oregano cultivars I planted have since become the most prolific growers in the garden, sending out spidery legs of fuzzy leaves all around the surrounding plants. The oregano would surely grow out over the sides of the garden wall if I didn’t trim it regularly. The one marjoram plant I have does not grow as quickly as the oregano, but this is largely because it is shaded more by the basil plants than the oregano. Nonetheless, it is one of the more fragrant plants in the garden and has been producing small white flowers for several months now. Unlike basil, flower production in marjoram does not alter its taste, so I’m happy to let it flower and capture a few pics when I can. 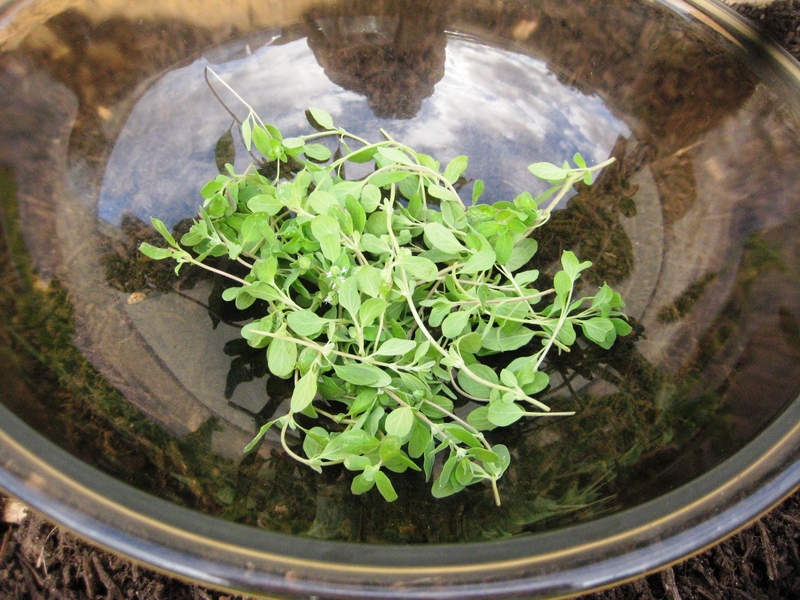 Oregano is also highly valued because of its medicinal virtues. For some time now, Michelle and I have used oreganol extract for its antiseptic and antifungual qualities. We take a dropper full when we start to feel physically run-down or feel like we’re coming down with something. I’ve used it applied to a toothbrush with toothpaste to fight mouth infection, canker sores and alleviate tooth pain. It is also useful as an antiseptic/antifungual topical ointment – whether applied to a cut, ant bite, athlete’s foot or nail infection, Oreganol truly works. Like thyme oil, the a major constituent of oregano oil is thymol, so oregano oil/tincture can also be mixed into a powerful mouthwash [thanks to Jonathan for correcting me here – the major constituent of oregano oil is carvacrol). 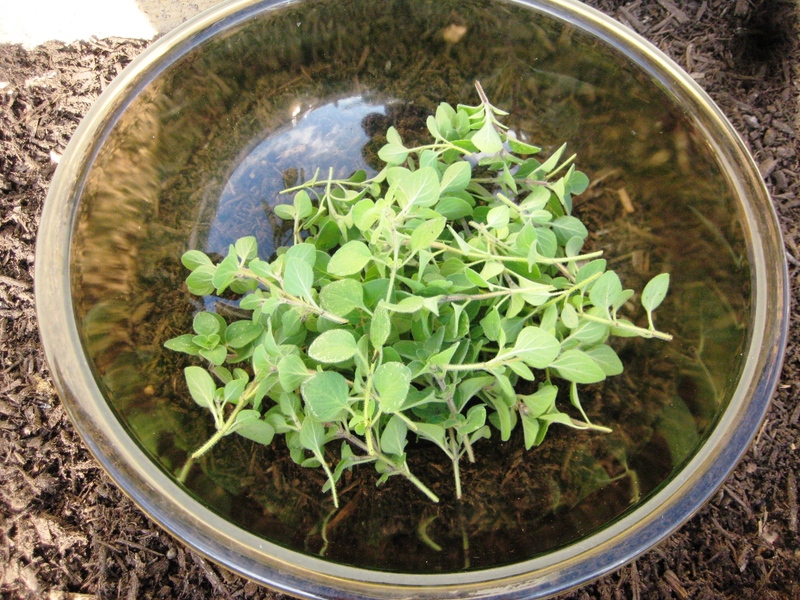 I hope to be able to harvest enough oregano to make tinctures I can use for these purposes, but I will continue to use Oreganol due to its effectiveness. Oregano and marjoram are harvested the same way. I follow the main branch to a point right above a set of leaves and cut there. This will produce a greater number of branches and a more productive plant. As always, I make sure never to trim more than a third of the plant at any given time. 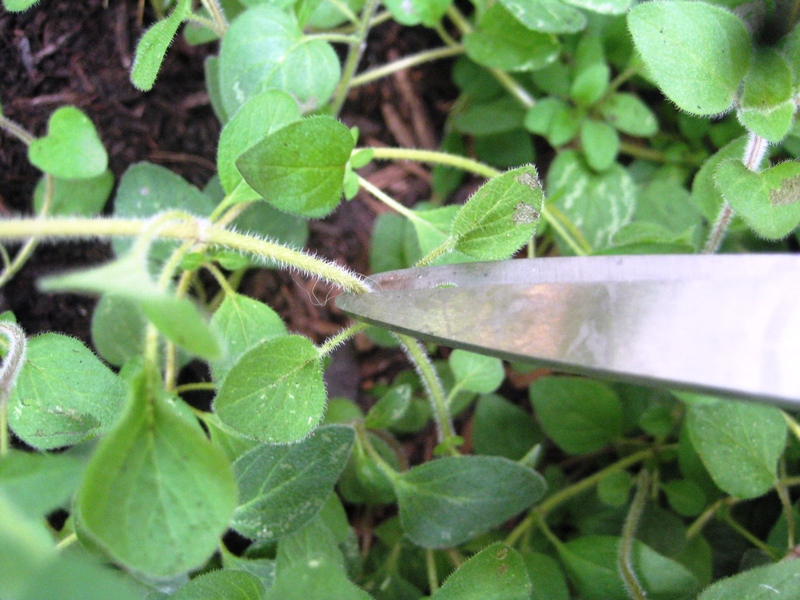 Unlike the marjoram, the oregano likes to “snake” along the ground, spreading out tentacles of branches. These branches then form small roots on the underside, which will eventually root itself to the new location. This can easily be used to one’s advantage when propagating plants as each rooted section can be cut off from the main plant, dug up and replanted. One can also force the plant to root in this way by covering sections of the branch with a small amount of dirt then digging out the section a few weeks later, severing it from the main plant. Like thyme, I bundle the oregano up with hemp cord and hang dry. They take only a few days until they are ready. Store in a sealed jar in the pantry and crumble the leaves when needed for the strongest flavor. I’m literally green with envy. 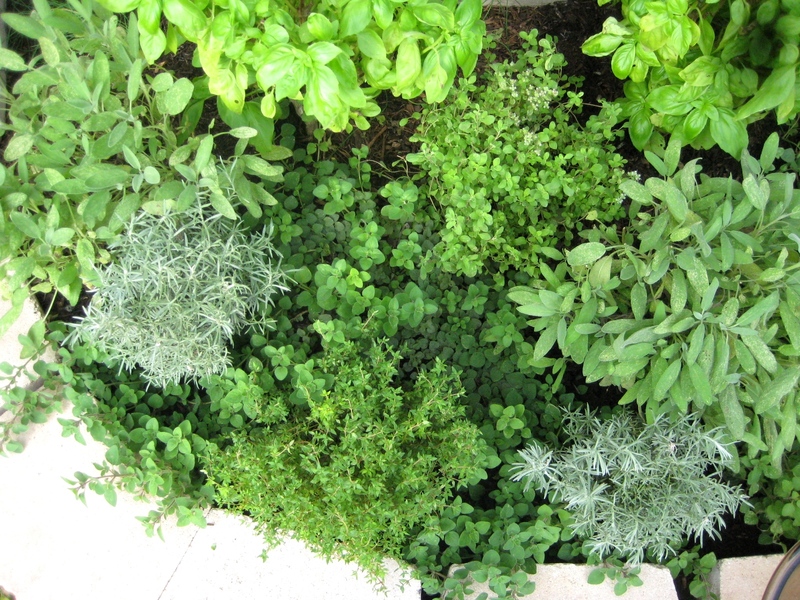 I wish I can have my herbs as green as those. And soon! How can you tell the difference between Greek and Mexican oregano? We have some in our back yard but i don’t know which kind it is. I sent you an email, but you can tell by the leaves and/or by the taste. Greek oregano is a true oregano. It has slightly furry leaves and a strong, pungent, bordering on bitter taste. It is used primarily in mediterranean foods. 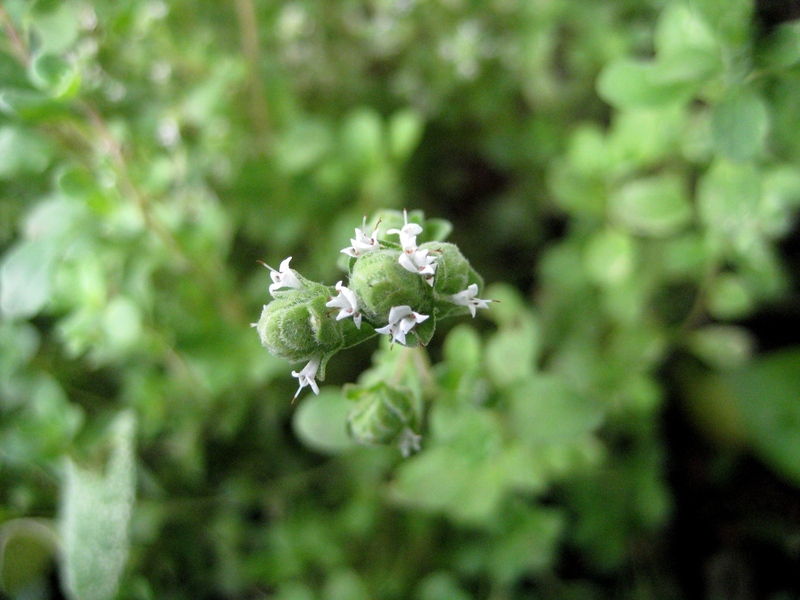 Mexican oregano is actually a member of the verbena family with a taste similar to Greek oregano. Its leaves are not furry, and it’s taste is spicier with lemony notes that are slightly sweet. It is used, as one would guess, in Mexican and southwest cuisine. Very helpful article, but a minor pedantic point if I may. Although oregano essential oil contains thymol, the predominant compound is usually carvacrol (which is chemically similar). Ratios of the two vary considerably however. Carvacrol has been researched quite extensively as an antimicrobial in food and medical applications. Thanks for the correction, Jonathan! I’ve corrected the information in the post. Cheers!